Concord Publications is pleased to announce the release of a new title in its extremely popular ‘Armor at War' series. The new title is focused entirely upon German light Panzers during WWII. Unfortunately, due to sales rights restrictions, we cannot offer 7066: German Leichte Panzer At War for sale in your country. Concord Publications is pleased to announce the release of a new title in its extremely popular ‘Armor at War’ series. The new title is focused entirely upon German light Panzers during WWII. This is an interesting topic, and with the large number of model kits available, it is sure to be an invaluable help and source of inspiration to model-makers. After WWI, the Versailles Treaty restricted Germany to a small army and no tanks. However, the nation was soon designing armoured vehicles and associated tactics. The first Panzer, for reasons of secrecy, was actually called Kleintraktor when it was conceived in 1930. This design became the Panzer I, and it fought in the opening campaigns of the war despite being somewhat obsolete. The heavier Panzer II appeared in 1936, and it too served in Poland, Western Europe, Scandinavia, Russia and North Africa. The final version of the Panzer II was the Ausf.L “Lüchs”, an armoured reconnaissance vehicle. The Panzer I and II occupy an important place in this book, with a whole range of variants pictured in black and white photographs. 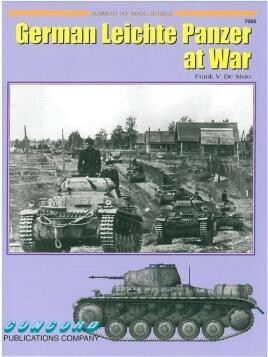 However, the book also covers the Panzerkampfwagen 35(t) and newer 38(t). These captured vehicles were absorbed by Germany after it invaded Czechoslovakia, and importantly these light tanks helped swell the ranks of panzer divisions. Photographs show these four main types of light panzers in all sorts of wartime terrain and locations. The book also includes a series of 16 colour plates showing markings and camouflage colours. The author’s knowledgeable text and captions, plus the selection of photos, make this book a worthwhile addition to any library on panzers. Frank De Sisto is a highly respected armoured fighting vehicle historian, with a specialist interest in World War II conflicts.